It’s the end of the year, and mortgage lenders are updating their guidelines and loan limits for the new year. For 2017, Fannie Mae and FHA have both updated their maximum loan amount limits. Click the image for a printable full-size information sheet about Yuma and other Arizona county 2017 loan limits. The new FHA loan limit for 2017 is $275,665 in Yuma county. You can get more if you buy a multi-unit property (like a duplex, triplex or 4-plex). $352,950 for a 2 unit, $426,625 for a 3 unit, or $530,150 for a 4 unit property. Any more than 4 units, and it’s considered a commercial loan. That means you’re into a completely different type of financing! We’ll have to talk personally to go into more details. Read more about conventional loans on our Conventional Loan product page. 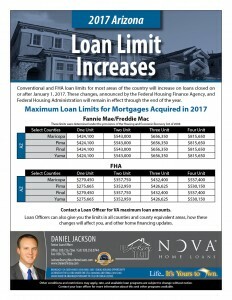 The new Conventional loan limit for 2017 is $424,100. Just like FHA, you can go higher if you buy a multi-unit property. $543,000 for a 2 unit, $656,350 for a 3 unit, and $815,650 for a 4 unit property. Read more about FHA loans on our FHA Loan product page. VA does not set a cap on how much you can borrow to finance your home. However, the loan limits are the amount a qualified Veteran with full entitlement may be able to borrow without making a down payment. 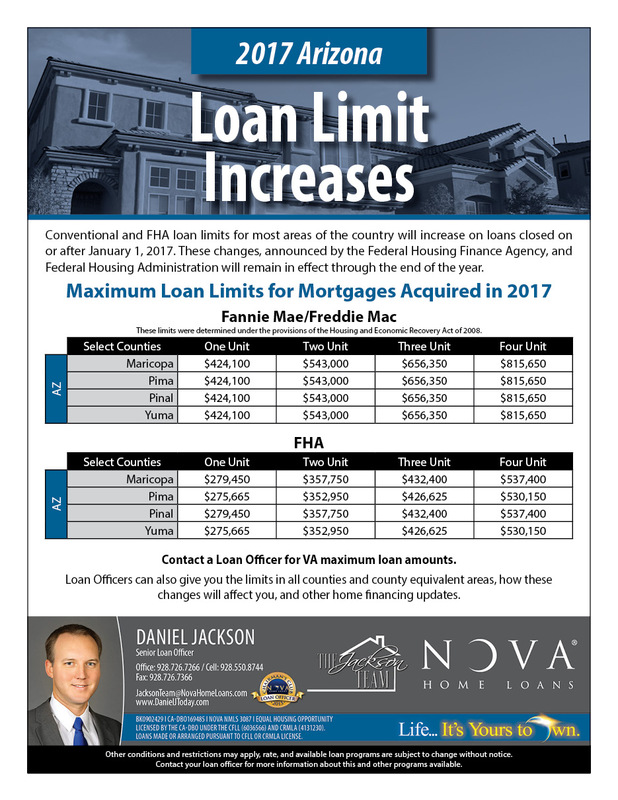 VA’s 2017 limits are the same as conventional limits set by the Federal Housing Finance Agency – 2017 Loan Limits (Effective January 1, 2017). Read more about VA loans on our VA Loan product page.